The finishing cost has to be properly calculated in the wood furniture manufacturing. The finishing cost could be significant cost component in the process of manufacturing furniture. If we run a finishing shop, then the calculation of the finishing cost is the key to make profit. For some peoples the calculation and estimation of the finishing cost could be quite difficult. The finishing process has lot of variable that need to be considered. The finishing has a great variation from the simple to the complex. A simple finish might be able to be simply done and only need small finishing material with simple facility. While the complex finishing could be a complicated process, requiring a long time processing, high skill peoples and even special materials and tools. The difficulty in the finishing cost estimation is added with the fact that the wood is natural material that has very big variation properties. However, the calculation of finishing cost must be done correctly in the furniture manufacturer, furniture shop or finishing shop. Actually the calculating to the finishing cost is not too difficult if we have enough experience in the finishing process. What we need to do is to make record for every finishing job we did. The record should include the type of and the amount of finishing material used, the processing time and the utility for the finishing process. The records will be very helpful to estimates the similar finishing processes. We also can do calculation to estimate the finishing cost. Basically the finishing cost is a technically matter that can be calculated if we can find the elements. The element of finishing cost are: the finishing materials, finishing utility and labor cost. Here are the steps that are needed to make the finishing cost estimation. The calculation of the cost of finishing should be started from the step to find the finishing process. We can start to make a step panel for matching a color panel standard or to develop new color finish. When we make step panel then we can find the finishing materials are needed and the process to be done. When we make a step panel we also need to consider the condition that may influence the finishing process such as: the condition of the unfinished good, the available facility, the shape of the product, the quantity, etc. Find our previous article : Step panel for furniture finishing. 2. Calculation of finishing material. When the finishing process is set up, then we will be able to calculate the finishing material needed for each processes. The calculation is usually based for each square meter of finish surface area. 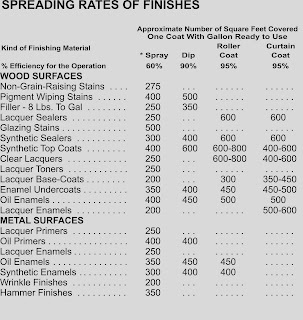 To help calculate the material needed, we can use the spreading rate of finishing material table below. 3. The calculation of the utility material. In addition to the finishing materials, we also need to account the utility of materials needed. Do calculation for the utility and supporting material such as: washing thinner, sandpaper, cloth, rag, electricity, etc. 3. The calculation of labor costs. Some finishing may can be done with a quick and easy process, but there are many complicated finishing process that take long time work. Therefore, we need to calculate the labor cost separately. The calculation of labor cost is calculated by estimate the working hour needed to do the process. Consider the complexity of the finishing process and the form and shape of the goods. With the proper calculation then we can estimate the cost of finishing to a particular color finish. The calculations of point 1 and 2 are usually based for every square meter of finish surface. If we do calculation for project with many product, then we can multiply the cost per square meter with the surface finish area of the goods. If we make calculation to propose a finishing project, then we need to add the profit factor and unexpected costs to the finishing cost proposed. 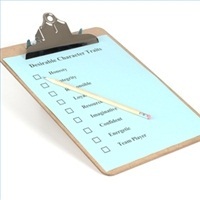 Amiable articles and the blogs really helped me a lot, thanks for the valuable information.